I got a new camera and this time it’s a video camera that can also take photos, as opposed to a camera that can sometimes shoot video. 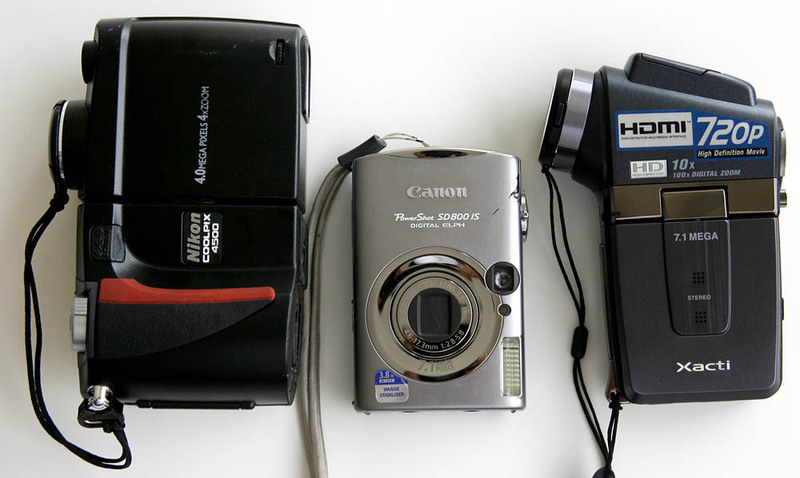 As you can see from the photo above my new camera (on the far right) is larger than my most recent PowerShot but smaller than my old CoolPix (anyone want to buy a CoolPix or PowerShot?) This new camera can shoot High Definition 720P video onto SD memory cards. At the highest quality I can get about 30 minutes of HD video onto a 2GB card. This is more of a teaser, not a real review which will come later somewhere after I write it. I will say this, Sanyo doesn’t know how to design lens caps as it keeps falling off and the battery compartment door came off by accident once already. More tease? Click here for a pair of quick samples I have online, one is HD video the other is a jpeg image, both straight off the memory card. You probably have to option-click on the MP4 filename if you’re on a Mac to download the big file or right-click if you’ve got a right mouse button and choose save for the file. About 22.8MB in file size for a 21 second HD video in mpeg-4. You’ll need a speedy processor and graphics card to play back the video smoothly. Yesterday’s blog photos were all shot with the Sanyo. And there is an underwater housing for this little HDV Cam. Damn dude, the resolution of video's getting scary – and it's gobbling up memory. Now, about 10 percent of our Reg reporters are trained to shoot video. Our managers are always touting video and multimedia, but I frankly think we lack the memory to fully launch an aggressive multimedia Web site – and we have 300,00 circ. It's one thing to tout multimedia in newsppapers; it's another to devote resources for good equipment and hardware. But I've always dug the Coolpix. The rotating screen is underrated. That's what I like about this HD cam, it compresses the video down quickly so it will fit onto an SD card. Amazing in that 30 minutes of HD video will fit onto a postage stamp sized 2GB memory card. If I had a 4GB card that would be a full hour of HD video! Because it is a video camera it does have a swing out screen that can face almost any direction. As I remember with my CoolPix Da Mayor was too slow on the shutter button once at Durty Jakes when someone was leaning over to check what we were seeing on the screen. Now if I can just find an underwater housing or ewa-marine bag for this videocamera I'll be all set. Heavenly, I mean, although heavy would probably work too.